The last installment of Etrian Odyssey, a popular dungeon-crawler series, which is designed for the Nintendo 3DS console. 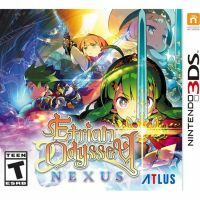 Etrian Odyssey Nexus is a classic dungeon-crawler RPG and another installment in the popular Etrian Odyssey series. The entire series was developed by the Japanese studio Atlus ever since 2007 and is now available on the Nintendo DS console. Over the years, Etrian Odyssey has seen several major releases and extended remakes on the Nintendo 3DS console, as well as three spin-offs such as Etrian Mystery Dungeon, Etrian Mystery Dungeon 2, and Persona Q: Shadow of the Labyrinth. Developers drew their inspiration from classic games such as Wizards and Bard's Tale, as well as from the first Shin Megami Tensei productions. Etrian Odyssey Nexus is the last installment in the series, which is designed for portable consoles with two separate screens from the Nintendo DS family. Etrian Odyssey games traditionally do not have a complex plot. This time around players take assume the role of a novice adventurer, who arrives at the floating city of Maginia. From there, by the order of Princess Persephony, the adventurer sets off on a journey together with other daredevils to discover the secrets of the Lemuria archipelago, in the centre of which grows a mighty magical tree known as Yggdrasil. Etrian Odyssey Nexus is a traditional dungeon-crawler in which players observe the action from the first person perspective. One starts the game by building a team comprising several characters. The developers included 19 different character classes in the game all of which have appeared in the series so far. After creating a character, one can freely decide on the further path of development of heroes, choosing new skills with gaining experience. For the first time in the history of the series, Etrian Odyssey Nexus gives players a map of the world, which contains not only the main underground, but also small and optional labyrinths, offering various types of attractive prizes. In addition to classic quests, players can also go on adventures in the company of NPCs. These scenarios allow players to get to know some of the characters introduced by the plot and gain additional experience. During the game players visit large locations and mazes, which are divided into square fields. In addition to hostile creatures, players will find numerous traps, portals, as well as puzzles, the solution of which unlocks the way forward. Random fights take place in the turn-based mode during which players can use standard attacks, spells, special abilities, and items. The game also features an option that is iconic for the series, i.e. the ability to create entirely new underground maps and mark their specific points on the dedicated lower screen of the console. However, this option can be switched off completely, and the game chooses a random the underground. Etrian Odyssey Nexus offers a total of four difficulty levels. Audio-visual layer of Etrian Odyssey Nexus maintains the style of the previous installments in the series. Developers still use the same graphics engine and technology, as well as 3D opponent models. Fans will also find there distinctive 2D character portraits created by Yujie Himukai and can enjoy original score composed by Yuzo Koshiro. Expectations: 8.5 / 10 calculated out of 1 players' votes.